Do you know what coding is? Simply put, it is a way to communicate with a computer by telling it what to do. By introducing young children to coding, you will help them develop life skills they will need in their future, such as problem solving, organization and communication. CADL offers apps, board games and books to help introduce your young child to coding. This month, we are also offering a Tadpole Storytime on the topic of Robots & Coding for Preschoolers. Tadpole Storytimes are a collaboration between CADL and Impression 5 Science Center. Held at Impression 5 on the third Tuesday of the month at 11 a.m., this science-based storytime for ages 3–6 features stories read by CADL staff plus related activities lead by I5 staff. Admission to I5 is free if you show your CADL card. Be sure to arrive early as space is limited and offered on a first-come basis. 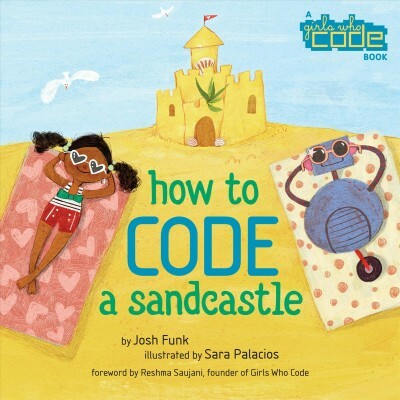 Stop by your local CADL branch or browse cadl.org/catalog for coding-related books you can take home to read with your child. Here are a few to get you started. Pearl is trying to teach her robot Pascal how to build a sandcastle by breaking down a big problem into smaller easier problems. In other words, Pearl is coding! Added at the end is a nice and easy ‘Guide to Coding’. This board book has a baby making art on one page while the code is telling the computer how to make art on the opposite page. Check out the series of other Baby Code! books on Play and Music.